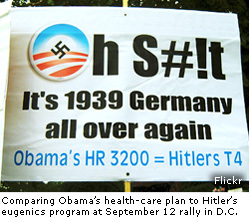 PIECES OF THE PUZZLE: Still Think We Aren’t Walking The Same Road As 1930’s Germany? The Holocaust started with the killing of the mentally ill, disabled and other socially ‘undesirables.’ The ideas came directly from the American Eugenics movement — which also lead to Planned Parenthood. This same spirit has held America in its grips for more than 100 years now, so why should this surprise us? July 1, 2015 in Politics. There is actually some very good stuff in this video that doesn’t get as much play as it should regarding the whole Eugenics movement. The Connection to IBM should be brought up more and made a standard part of the Exposure. The video is additive and supportive of this post ! !